Do you associate the fall with certain types of food? Soup, chowder, stew, chili? I say yes to all of the above. But last year I rediscovered a lost love...my slow cooker. I have to admit, we had a love/hate relationship for quite some time. I loved the simplicity of using it, but hated how my roasts came out. Even though they were fall apart tender, it just seemed to me that they were a bit chewy or dry. I know, weird right? How can you cook something all day in juices and have it seem dry? But a while back I discovered that if I cooked the roast on high for 4 or 5 hours, VS low for 8 to 10 hours, it came out moist and tender. Who knew? I made a version of this a few months ago and was so happy to see Kevin actually enjoying a roast I made without mumbling that it was "a tad dry and chewy". I knew the acid test was going to be my son. He has refused to eat roast for many years now because he got tired of the chewy texture. So I bit the bullet and decided to make this for one of our family nights. He came over with his girlfriend and my daughter and her girlfriend tagged a long too. As soon as he came in he mentioned how awesome the house smelled. I secretly did a little dance. Ummmmm, eeerrrrrrrr Roast and veggies. Now I get the laser stare. OK before you convince yourself that dinner tonight was bad idea just wait and try it. Trust me, it will be really good I promise. I did get the "Ya I have heard this before" look but he was willing to try. Once we all sat down to eat, I waited for him to take his first bite. The shocked look on his face was enough for me and I took a nice bite with a very satisfied smirk on my face. That will teach him to doubt Mom.....or to come over for dinner more often.....I am not exactly sure which lesson he learned. Heat the oil in a large skillet over medium-high heat. Season the roast with salt and pepper and sear on all sides. About 10 minutes total, you want a nice brown all around. Transfer to your slow cooker. Season the roast with salt and pepper and place in the bottom of the slow cooker. Place the onions, garlic, and carrots around the roast. Pour the stock and the vinegar into the cooker, cover and cook on high for 4 to 5 hours. Remove the roast and allow it to rest for 10 minutes. Slice the roast and serve alongside the vegetables and mashed potatoes. Drizzle with the au jus. That Pot Roast looks so moist and tender. I love doing beef like that in my crock pot. It makes it taste so good and I don't have to stand in the kitchen all day. Yes and I love how your whole house smells good all day! That pot roast looks really good. My kids aren't a big fan of pot roast but I love it. I don't do it that often either. Thanks for the recipe. i absolutely adore pot roast! I think I need to pick one up at the store this week and make some of this! Oh I hope you do!! Hum, I do not have a slow cooker but you just gave me an idea--Balsamic vinegar would help to tenderize the roast--will try adding next time I make it. Yes, it would work well with a braised roast too. I love pot roast! We had one just last week that I made in the slow cooker. My son complained it was too spicy. I need to try it with your recipe. Ha! I loved the story that went with it. :) I'm glad the pot roast was a hit! 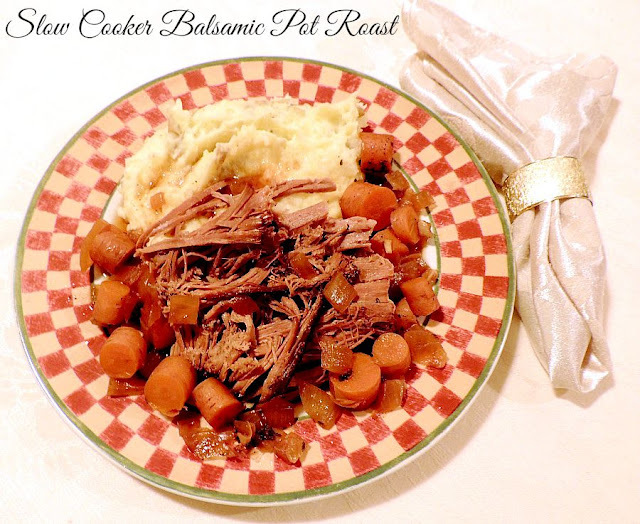 I love Balsamic Pot Roast and serve it like you do, with carrots and lots of mashed potatoes :) This is a keeper recipe! Good recipe, I love pot roast. Is kosher salt more salty than regular salt? Pot roast, beef stew, chili...yep. I think of these in the Fall. Looks good Bobbi. I never thought of putting balsamic vinegar on a roast but that sounds great!! Holy Hungry-Man, this needs to be in my kitchen, or better yet, my stomach. Looks amazing! That looks so tender! And delicious too! This looks delicious! I absolutely love pot roast (I actually just made it the other night, matter of fact) but never thought of making it with balsamic! Great idea! Pot roast in the slow cooker is the absolute best way to do it. Love the balsamic idea though! i like the idea of having mashed potatoes on the side. my family usually does potatoes with the roast. Yes I love mashed potatoes. I even add roasted garlic to them sometimes YUM!! looks really tasty i will have to give this a try. I like pot roast but I dont make it enough. What a great cozy dinner for a cold night. Yes, and if you can find your roast on sale it is a terrific budget meal as well. This looks so yummy. I will now have to buy one when I go shopping and use your recipe. I am glad you finally were able to get your roast to where it is not dry. It is frustrating when you make a big dinner and it goes wrong. This looks delicious. I love a good pot roast. And you serve it like I do with mashed potatoes! I'll have to give this one a try! I love my crock pot and I love pot roast. Yummy! Oh wow my family loves pot roast and this recipe looks SO delicious! And in the slow cooker--can't beat that!! I love it!! I think Pot roast is great for any occasion, at least for us, no one ever refused this tender and delicious meal, thank you for the recipe, I need to prepare it to cheer up our folks.